The challenge with running in wintery conditions is often about grip on Ice. 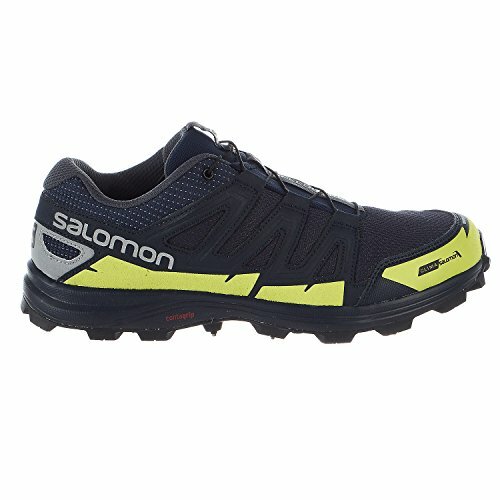 So Salomon added 15 carbide spikes to the lugs of Speedspike CS to make sure you have the confidence to run through an icy parking lot or a snowy trail. And they added a ClimaShield shell around the forefoot to keep your toes a little warmer as you fly through wet, snowy conditions. A durable protective band around the base of the foot resists abrasion and cuts. And a waterproof membrane over the forefoot helps keep toes dryer and warmer. Moderate cushioning and a lower platform help Speedspike stay very stable in soft or uneven conditions. Details: 9 Carbide-Tipped metal spikes, premium wet traction Contagrip outsole, lightweight muscle and injected EVA midsole, EVA shaped footbed, molded EVA sockliner, anti-debris mesh, water resistant textile upper, mud guard protection, mid feather construction, reflective mesh, lace pocket. Unisex models are sold under men sizing. Material: Mesh, Rubber.